Are You Spiritually Minded Yet? 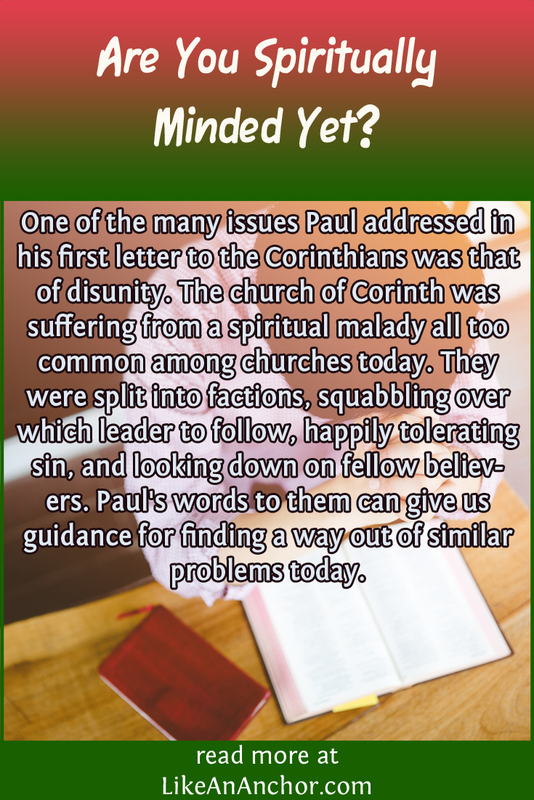 One of the many issues Paul addressed in his first letter to the Corinthians was that of disunity. The church of Corinth was suffering from a spiritual malady all too common among churches today. They were split into factions, squabbling over which leader to follow, happily tolerating sin, and looking down on fellow believers. Paul’s words to them can give us guidance for finding a way out of similar problems today. Paul is begging these people in the name of our savior to stop their contentions and divisions. His questions, “Is Christ divided? Was Paul crucified for you” shine a spotlight on how ridiculous their squabbles and disagreements really are. Christ is not divided and He’s the one into whom we were baptized. There is no division when we’re in Him. When Paul talks about being like-minded with each other in Philippians, he follows it with “Let this mind be in you which was also in Christ Jesus” (Phil. 2:1-5, KJV). Our unity comes from all of us learning to think like Jesus. It is the height of arrogance to think we could come up with a better plan, interpretation, or idea than what He has given us. Even though we have the mind of Christ and should be more guided by the spirit than the flesh, the Corinthians weren’t. Paul “couldn’t speak to you as to spiritual, but as to fleshly, as to babies in Christ.” Something was blocking them from becoming spiritually mature. 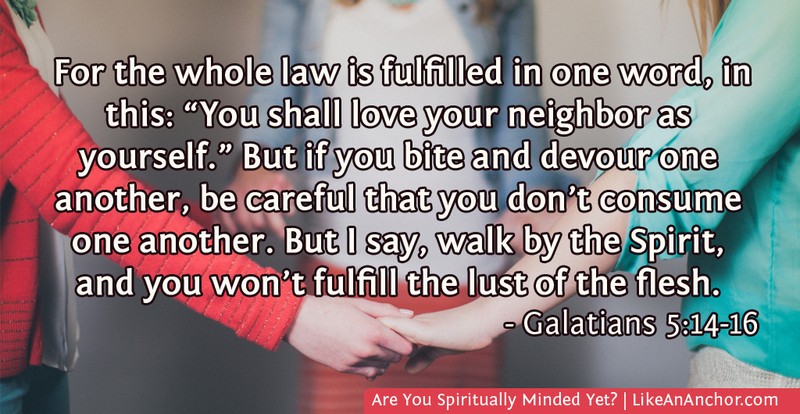 When our minds are caught up in squabbles and jealousies we aren’t spiritually minded. Paul then goes back to talking about how ridiculous it is to follow human beings. Church leaders are just there to plant some seeds and water the Lord’s garden. They’re nothing compared to the One who brings you to the point where you can bear fruit (1 Cor. 3:4-9). “You are God’s farming, God’s building” (1 Cor. 3:9, WEB). You’re responsible for how you build on the foundation that is Jesus Christ as well as how you treat the other “living stones” that make up God’s house (1 Cor. 3:10-17; 1 Pet. 2:1-10). God wants an individual relationship with you, but not just with you. His temple only becomes what it’s meant to be when His people are together in unity. Now Paul gets back to the problem which started this whole discussion — sects within the Corinthian chruch. Paul has been writing as if he and Apollos headed these sects although they would never have started something like that. Whether others in Corinth set things up as if they were following Paul and Apollo or Paul just decided not to name names among the divisive leaders, his point is clear. It’s past time for the Corinthians to grow up as Christians. We, like the Corinthians, need to learn to think with the scriptures, not add to or misinterpret them. We need to live humbly and respect each other. We’ve got to stop highlighting our differences and instead pursue unity. And we must remember that all we have from God was received as gifts, not earned or taken by us. It’s time for the whole church to stand up for truth and stop tolerating divisions and sin. Tolerance is not the same thing as peace and we’re not doing anyone in the church a favor when we overlook something wrong in order to avoid confrontation. “Peace” in the Hebrew sense (which is the language Paul, as a former Pharisee, would have known the scriptures in) goes beyond the absence of strife. It means wholeness and completeness, which can only be had when we’re all living in accord with Jesus and the Father. Paul is specifically talking about tolerating a sexual sin when he berates the Corinthians because they were “puffed up, and didn’t rather mourn, that he who had done this deed might be removed from among you” (1 Cor. 5:2, WEB). But it can apply to other things as well, including the divisions which are our topic today. Just as “a little yeast leavens the whole lump,” so a few wrongdoers in the body can sour all the others (1 Cor. 5:6, WEB). The key to fixing this is found a few chapters back in 1 Corinthians. One of the key things that’s overlooked in the Matthew 7 “judge not” passage is that after you take the beam out of your own eye, you’re able to take the speck out of your brother’s eye. We’re to continually align ourselves with God’s standard and we’re also responsible for correcting, in love, our brethren if they’re going astray. We do this by using God’s spirit to learn to think as He does. The more each person in Christ’s body develops His mind, the fewer divisions there will be. And when you do have the mind of Christ, you’ll be able to offer and accept helpful correction from other believers as we all learn to walk in the spirit.